I walked through an Asian inspired bamboo gate and entered another world- the world of bonsai. Some trees were blooming, others just leafing out and some had trunks thick and gnarled like they've been alive 200 years- and they have. 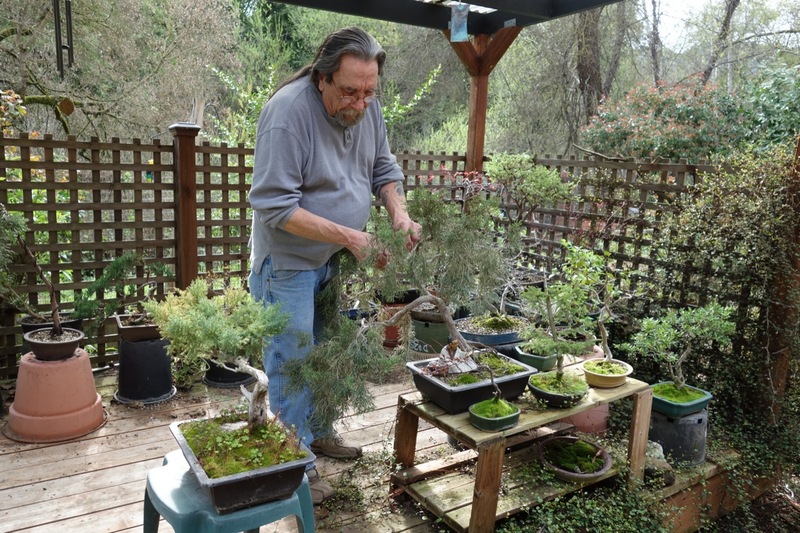 Here at the garden of the Santa Cruz Bonsai Kai president, Ron Anderson, I was treated to a tour of 100 specimens in his personal bonsai collection. The word bonsai comes from two Japanese words that provide the most basic definition of this living art form. "Bon" is a tray or pot , while "sai' means to plant. R on told me he has always been interested in Asian and Japanese gardening. It was only 5 years ago, however, that his father-in-law took him to a bonsai show. He was hooked. His first bonsai? A boxwood that someone was going to throw out. He gets a lot of his plant material that way. Craig's List has been a great source of old, gnarled plants. A giant rosemary shrub awaits dividing in a wooden box. A huge Tam juniper was on it's way to the dump. 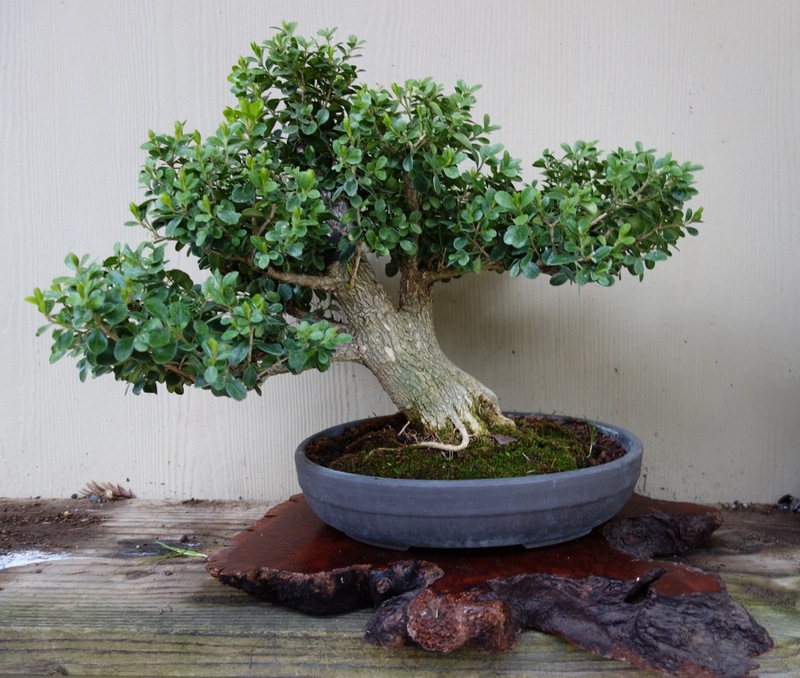 He also has many old, overgrown boxwoods in various stages of training that have much potential.Although many people new to the art of bonsai start with a little finished juniper or buy starter plants, collecting wild trees ( yamadori ) is one of the best ways of acquiring new material for bonsai. Ron found a Sierra juniper in a crevice in the Lake Tahoe area that is probably about 200 years old from the looks of the trunk. Care was taken to get most of the root system, otherwise the tree would have been doomed. A tree collected from the wild must be treated to the highest standard of care. But the reward or a unique yamadori bonsai is a worthwhile prize for spending days, months or years searching for potential material. Ron also finds potential bonsai specimens in nurseries, looking mainly for 5 gallon or larger plants with an interesting trunk. That way the tree looks more like one found in nature. The oaks on Hwy 152, are good models for bonsai design, he says. Bonsai enthusiasts strive to evoke the ravages of nature in their trees. Except for young bonsai-in-training, most specimens seem much older than their small size suggests. And they may also appear to be veterans of years of struggle against natural forces. Actual age is of less importance in bonsai than the illusion of age. To that end, Ron will shave, cut and sometimes burn a trunk or branch to create the look of a lightning strike. In Ron's collection are flowering quince, pear, elm, boxwood, juniper, azalea ( picky, he says ), cotoneaster, crabapple, olive, persimmon, dawn redwood, coast redwood, strawberry guava, Korean hornbeam, peach and "the cadillac" of bonsai- the black pine. Ron has two of these now. Most bonsai live outdoors like they do in nature. There are very few that thrive inside. For his wife, Ron is training an olive tree that will eventually live indoors. Starting with a 7 ft tree, it's now 6 " tall. He is forcing new limbs to grow out from the trunk and it now has three branches. What conditions do bonsai like? Ron keeps all of his collection outside year round. Some are under trees while others are out in the open even on frosty nights. During the summer they get morning sun and afternoon shade. He waters all of them every other day during the growing season but cautions that he knows his plants and their requirements and someone else may have to fine tune their own individual watering schedule. There is no soil in his soil mix, preferring a mix of small pumice, red lava and a few other things he's learned about but "can't give his secrets away". The most important thing is for the mix to have perfect drainage or the tree roots will rot. Ron transplants his deciduous trees every year as they grow so fast. Evergreen trees are repotted every 3 years. A rootbound tree, with circling roots in the pot, won't be healthy and growing new root hairs. This will inhibit the growth of the trunk and it won't be able to increase in girth. 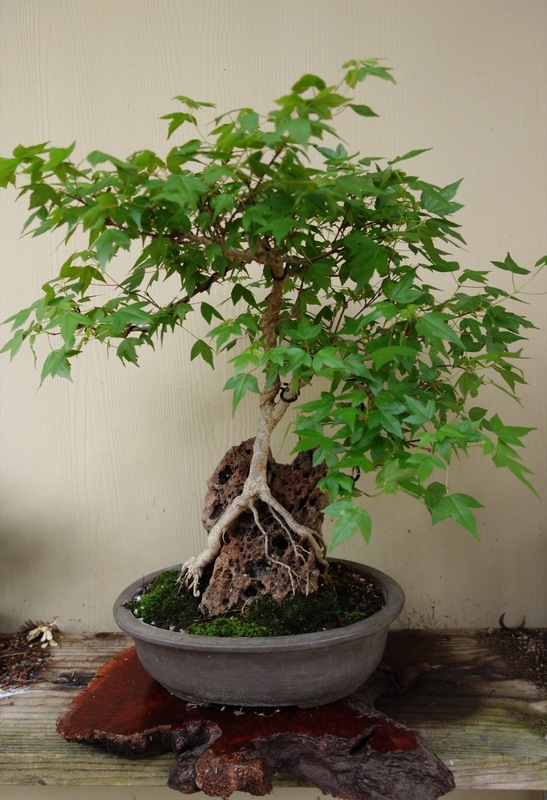 Deciduous bonsai, Ron explained, are grown in unglazed trays usually in soft, dark colors. Colored glazed containers are reserved mainly for shows although flowering and fruiting plants are sometimes grown in them also. Santa Cruz Bonsai Kai meets every 3rd Saturday at 9am at the Live Oak Grange hall on 17th Ave in Santa Cruz. Workshops are held on the 2nd Wed of each month at 7pm at the Aptos Grange hall. Ron said that the club has increased its membership by 30 due to its presence on Facebook which is good as without new members, the knowledge won't be passed on. 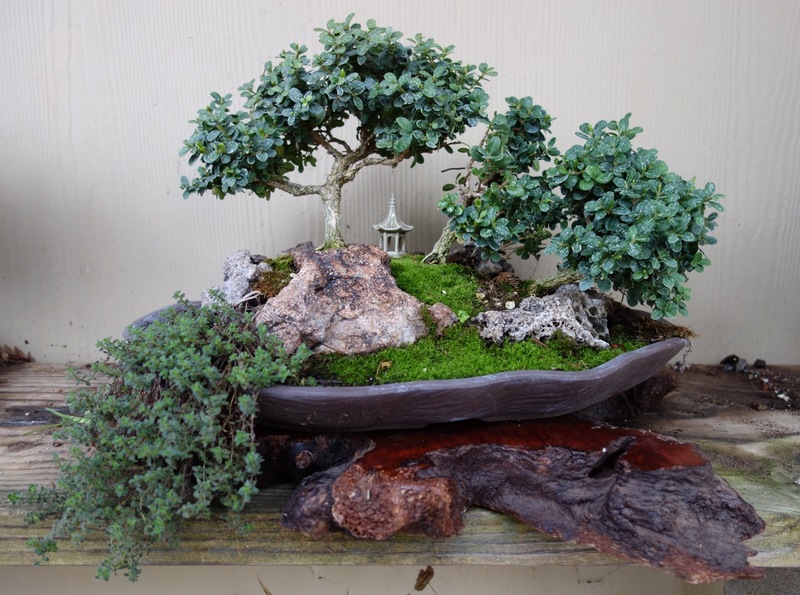 And don't miss the upcoming Santa Cruz Bonsai Kai show Saturday, March 24th and Sunday, March 25th to be inspired and have all your questions answered about growing bonsai from the experts. Both days will feature a demonstration at 2 pm by the famous bonsai sensei, Katsumi Kinoshita. In the demonstration, Kinoshita will show where and how much to trim an ordinary piece of plant material, how to wire the branches to set their growth in the desired shape and how to pot the tiny tree. The completed bonsai will be the prize in the raffle afterwards. At the show every plant sold comes with an invitation to Santa Cruz Bonsai Kai meetings, where new enthusiasts are welcomed and nurtured.